One week after the arrival of their second son, Jessa and Ben have chosen a name! 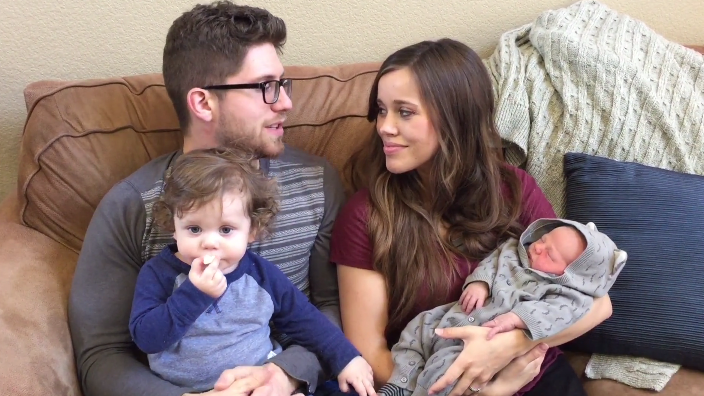 Introducing Henry Wilberforce Seewald, younger brother of Spurgeon Elliot Seewald. The elated parents share the meaning behind the name in the video below. I absolutely adore his name! So strong, suits him perfectly! Time to put a new little guy in the header!! I love the name Henry. Sorry but not a fan of that name. Henry ok but the middle name? Henry is a strong name for this little guy. Henry is a cute name. I have always loved the name Henry and if my husband was up to it, I'd absolutely call my first son Henry as well. I appreciate that they put so much thought into the names of their children and pick names that have meaning to them. Having Wilberforce as a middle name is somewhat unusual but since he will go by Henry I feel like thhey didn't do him any disservice. However, I do feel a bit sorry for Spurgeon!! It would have been so easy to call him Elliot Spurgeon Seewald and have him go by Elliot. I wonder if he will ever ask his parents wh they chose an unusual first name like Spurgeon for him and a name like Henry for his brother. I hope Spurgeon won't feel disadvantaged in the future when he meets ignorance or ridicule regarding his first name. They also could have named him Charles, since that was Charles Spurgeon's name. They seem to like the weird. Spurgeon is an adorable name!!!! Beautiful names full of strength and faith. What is the obsession with using last names? Henry is a cute name. I can't stop laughing at the rest though. The first name not so bad, the middle what were they thinking, he has to live with this for ever. A: How many people, besides your closest friends, actually know someone's middle name? B: Obviously they were thinking that they admire William Wilberforce and wanted to honor his legacy by making his name part of their son's name. Something that is frequently done in naming children. Was there any doubt that the name would be announced on a Monday, just in time for another People article? I know the song, though I'm sure the Duggars don't -- haha. I cannot get the video clip to play. I tried using chrome and firefox. I like how intentional they are about the names that they choose for their children. And I am glad that they chose to go with the more common of the names for his first name. Well that's a name. Maybe he'll learn to own it as he grows up. Or maybe he'll do as my mom did and have it legally changed as soon as he is old enough. I like it. They really are a lovely family. What a beautiful baby boy!! Both of thier children are stunningly hansdsome! I was right. I predicted the seewalds would wait until Monday. Just happens to coincide with final episode of counting on AND people magazine releasing new content. Way to exploit a baby to boost ratings and get a pay check from a rag mag!!! Henry!How nice! Spurgeon took a bit of getting used to, but Spurgeon looks like a Spurgeon. Best of luck and much happiness wished to the Seewalds. Maybe a little too much thought. Lol!! They way overthink these names, if you ask me. I love chocolate, but I wouldn't name my child that. I love the character trait of Persistence, but I wouldn't name my child that. In Wal-Mart once, I heard them page an associate named Velveeta. Nice! I wasn't expecting that at all! That is so sweet! We read a book on William Wilberforce and it was great. We are currently reading one of Matthew Henry's books as well! Congratulations Ben and Jessa on your new Henry Wilberforce! I like Henry!! Too bad they didn't switch Spurgeon's first & middle names. He will be teased or be nicknamed as he gets older. As a teacher I see so many names "creatively " spelled which leads to mispronunciations, teasing etc. Of course, these children will likely be home schooled & can avoid some of that!! Beautiful babies, regardless! Time to update the Header!!! They will get around to it. :) when they do, Israel & Spurgeon have grown and need updated. Maybe even Anna's little ones. They are Josh's little ones too you know. Oh I love that name! Great choice of middle name. Bless you all. I'm sure you will raise wonderful children who will love and serve the Lord. I dont know why they dont use the first name of the people they are naming him after. Seems like just seeking attention to use the obscure last names. Henry is ok. Wilberforce? what were they thinking? What a unique and meaningful name. Names are such powerful parts of who we are, may your little boy grown up into his God given name to be someone who perseveres and is dedicated to others knowing justice and freedom in Christ. Blessings Sewald family!! Congrats Jessa and Ben on the new bundle of joy. Jessa blessa has always been my favorite Dugger. I'm glad they gave the kid a normal name like Henry. Also I'm glad they did not give all their kids the same first initial. Henry is a really nice name and one I think doesn't get enough love! It's a name that reminds me of a rabbit or a deer, for some reason. I also think it looks nice spelt like Henri. Welcome to the world, Henry! William Wilberforce was a great man, but why not just William? Adorable baby, though. Henry Wilberforce is the son of William Wilberforce. Henry Wilberforce converted to catholicism and did great. I Wonder if the know Henry Wilberforce? If they didn't before, they do now! The video said it wasn't available. I would love to know the story behind his name. I hope you will have it written out so I can read. You need to update your header now! Henry is a great name! I love both their boys' names!!!! So much thought into it! Ugh, kids, this isn't the right way to try to be quirky. Names last a lifetime. Congratulations on your new little one Henry Seewald he is beautiful. Hello, Henry! Spurg was so cute holding onto his brother's foot! Glad they didn't feel it necessary to name starting with the letter S.
I'm also intrigued with them gifting their son with his middle name. Hopefully it welcomes and nurtures knowledge to provide a clear direction. Many blessings to the family. May God continue to bless this wonderful family! What a wonderful name! So meaningful and full of hope, life and strength. Love that they would chose to name their son with a name that empowers him to fight for justice. I really respect this couple and can truly see their heart for the world, and compassion for people. I'm glad they gave the baby a normal name like Henry. Also it's good that they are not giving all their kids the same first initial. "Normal" name? How about "old fashioned" name. Are Jessa and Ben aware that William Wilborforce had a son called Henry too?? I love the name Henry! Love the name! Good job! I'm just thinking of the kids's peers when they are older and how many times their lives they will have to keep explaining either their first or middle name. I actually feel for them! Parents have to keep these things in mind when naming their kids before they go off on a wild safari thinking of off the wall first and middle names. I am thoroughly convinced now that no woman should ever be allowed to choose a baby's name while pregnant. The hormones cloud her thinking. It seems pretty clear to me that Benjermin is the one doing the naming in that household. Him after Charles Spurgeon, why not just name him Charles?? Really have to wonder about a family who sells the announcement of their child's name to a TV show. I know what you mean. I used to love Jessa but it seems she's money hungry now. What is " cute" about the Henry??? Sounds like an old farmers name. so you not stay with one letter. Like you family. I am so glad they call him Henry Wilberforce instead of Wilberforce Henry! I still want to call Spurgeon Quincy and I think Quincy and Henry sound good together! It's not too late to change spurgeons name Haha. Haddon would've been a fine name. I wish the comments were loaded sooner. Reading them is the most fun part of this website. That's a good idea! Maybe they will wait til Jill's baby is born? Love the name Henry, but feel so badly for those children. How awful to grow up in the shadow of these other men whom they are named after..whom their parents deem pillars of virtue, but were very human. Why not just allow them to be their own persons paving their own way with The Lord? For all those asking what Spurgeon will think one day (because he ended up with the highly unusual name and Henry ended up with the more common one); it happened in my family! I have a very unusual name (not quite as unusual as Spurgeon but different enough that I've only met one other person with my name), my sister has a name that's not common but also not very unusual and my brother has an incredibly common name- more common then Henry! It didn't cause some big rift between us siblings, it's just the way it is. One time I was curious enough to ask my parents why I ended up with such a different name compared to my siblings. There wasn't really any rhyme or reason, they're just names that they liked. Coming from my opinion and experience, I don't think it's any big deal to give one child an unusual name and the other a more common one. Did they look up the historical person by that name, Henry Wilberforce? Why did they give their first kid a crazy name and this one a civilized name? Come on kids don't degrade your kids. There is nothing degrading about either child's name. Unusual is merely different, not wrong. Absolutely, I mean, look at MY name. Henry Seewald! what a well thought out name. love it. Wilburforce is a great middle name. looking forward to seeing pics of Spurgeon and lil Henry. They should have named Spurgen with his middle name first. Henry is ok reminds me of an old man. I think they are coming up with these names for the attention it brings them. I love that they've named both their boys after men of faith. I think that both Spurgeon and Henry will strive to be like these men because their parents had so much respect for them. I wonder if Ben and Jessa knows that William Wilberforce had a son named Henry Wilberforce! And he spent his life converting people to catholicism! I find it so strange that the very person known for catholic rants, names his own child the exact same name, with the opposite intent! Good point! Someone failed to do their research or is Ben hypocritical? So nice to see so many positive comments, certainly overshadows the few negative ones. I feel so sorry for people that can't find something nice to say but know it usually comes from their own feelings of not measuring up. I think if we feel the need to be critical of something that doesn't affect us directly it's just better to say nothing. Think of the bullies you know... that's what they do first cut down their prey with words. Oh. I thought they were naming him Henry after the brace "Prince Henry the Navigator who, with his deep religious faith and unshakable courage, launched a discovery of the New World trying to find new routes to the Indies. One of his main goals was to advance the cause of Christianity, so I figured they were thinking of him. Brilliant name, Jessa and Ben! Congratulations! After reading the comments, maybe they named him after Henry Wilberforce instead of William. However, I can't see the video so maybe you all know something I don't. I have my own opinion of the boys' names, but they're not my kids, so my opinion doesn't matter. They'll name them whatever they want! They're their kids! Congrats on the new baby.